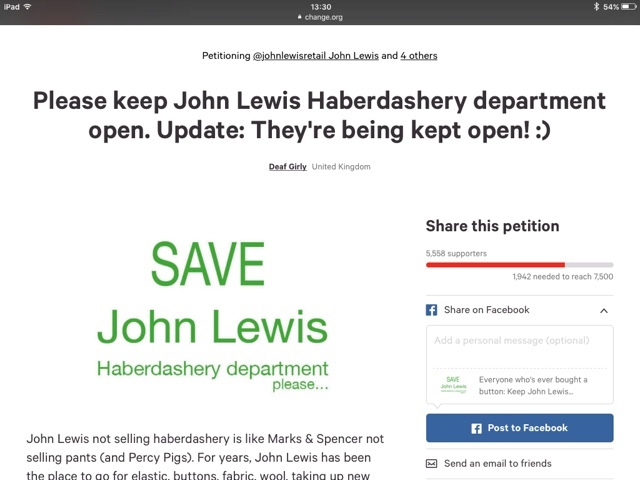 Two weeks ago, after reading a news article in The Telegraph which said that John Lewis Haberdashery would be closing, I did something I've never done before – I set up a petition. A petition appealing to anyone who had ever bought a button to sign and show their love for John Lewis Haberdashery department. I'm sat here in a cafe in central London looking at that petition and marvelling at the 5,562 of you who signed it, many in the first day, many in the first hours before Peter Cross, Director of Communications & Brand Experience at John Lewis got in touch to reassure me that, despite the news stories and rumour, John Lewis Haberdashery was safe. One of the things Peter also did was invite me to visit John Lewis's flagship haberdashery department on Oxford Street and talk with the haberdashery buyer Ian and Emma from his comms team. And of course I jumped at the chance to meet the person who is in charge of John Lewis's button selection – amongst other things. 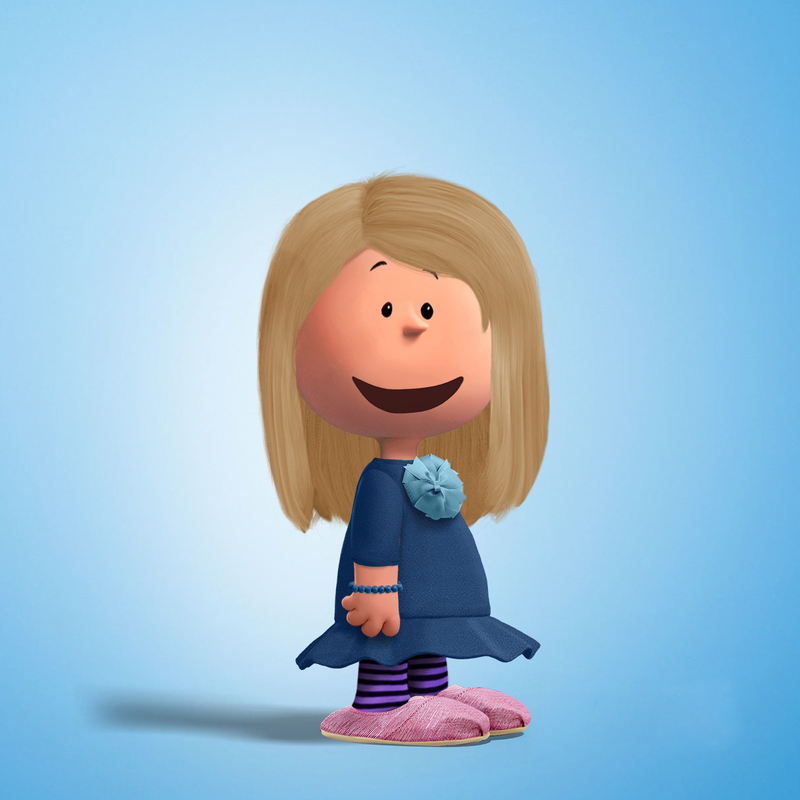 And don't worry, everything I found out and was reassured about, I will go back and check on in 12 months. But it really wasn't just about me. It was about the 5,000-plus people who signed the petition and many of you were still worried. So I asked you to get in touch and let me know what you wanted me to ask – my email account went mental. Many of you were worried about the fabric selection being scaled down and the increase in 'kits' rather than individual things you could buy separately. Trimmings came up a lot – you wanted trimmings available off the roll rather than pre-cut, and ribbons fell into that category, too. Others asked if John Lewis could showcase and celebrate British suppliers of wool, scissors, patterns and other such things. Those outside of London also pointed out that some of the kits and wool felt very 'London priced' and what you really wanted was affordable, good quality products that you knew would do the job. You felt that starter kits and one-stop projects were taking away your shelf space. And it wasn't just requests. I read comment after comment of people praising the knowledge of John Lewis staff in the haberdashery department and expressing a wish that these kind of people remain at the heart of this department. In addition to the staff, you wanted classes, tutorials, workshops and places within the department where you could share and learn. You wanted haberdashery to stand proud in store, not be tucked upstairs with children's things or out the way in sports and leisure. If you had your way, make-up and beauty would be quietly moved to get haberdashery back on the ground floor. There was also many suggestions of putting it near home furnishings. So, armed with all this, I went to visit John Lewis Haberdashery on Oxford Street. It is tucked away upstairs on the fourth floor past the kids's clothing, but it is there. And I was immediately greeted by 'The Makery Table' and two women knitting and having a chat with each other. I met with Emma and Ian, who has been a buyer at John Lewis Haberdashery for six months and there's no getting away from the fact that he is passionate about John Lewis Haberdashery. Firstly, and this was in answer to my direct question and two more slightly differently worded questions, John Lewis is NOT and will not being getting rid of its haberdashery department. Nor is it scaling back on the size of them. According to Ian, 16 John Lewis Haberdashery departments now have places where people can meet and make. In the Leeds store, there is a community room which can be used for that purpose. FABRIC There are 1,200 different fabrics available at John Lewis Oxford Street. Other John Lewis's have on average 900 different fabrics. WOOL When it comes to wool, John Lewis is very UK focused, working with British suppliers and ensuring the Wool mark is on their products. They are offering pattern books and pattern folders and have begun to re-catalogue these according to clothing, home, kids and hobbies. I had a flick through and they look good. If you don't have them at your John Lewis, let them know that this is something you want. KITS Yes there are kits – quite a lot of kits actually – and I told Ian that this was not something you were thrilled about. Ian explained that in an Etsy and Pinterest-driven world, some customers are looking to copy what they find online and John Lewis is working with those Etsy people to bring their work in store. Does it take shelf space away from more traditional items? Sadly right now it does. But I hope that Ian meant it when he said that they are always looking at what people are buying and responding to that. BUTTONS It's good news for buttons – Ian and his team are in the process of re-working the button department, which means that 2017 will see a refresh and revival of the wonder that is those little plastic tubes of buttons of all shapes, colours and sizes. I personally can't wait for that. TRIMMINGS Trimmings also are getting a refresh – 100 extra trimmings are hitting the shelves on cut-to-order rolls and I was assured that this was not just a 'London thing'. EVENTS These are having a comeback, which is good news. Ian and his team are looking at how they can get experts in to run workshops and classes across the country, not just in London. They are also looking at making sure that your experience of sewing machine buying doesn't stop as you walk out the door with your shiny machine and two-year guarantee. John Lewis wants you to make with them, in store, and it wants established talented crafters, knitters, sewers and creative types to inspire a new generation of people. As Ian and I were finishing up our chat, I got to meet Sylv – she has worked at John Lewis in the haberdashery department for 47 years. I watched her afterwards moving around the shop floor, chatting to people, picking things out and I realised that it's people like her that matter more than ever. Ian asked me to send him your comments, which I am going to do (without names or emails attached as many of you requested this) – collated and laid out so he can browse them and see what else made more than 5,000 of you speak up. I know I am a bit of an optimist, but really do hope that Ian, and the peeps at John Lewis, will listen and that haberdashery remains safe and even better, grows. They told me that they want to make haberdashery more relevant. And relevant is about giving you what you want. So go in to your local store and let them know what you want, and what's missing. You know I did that in my local Sainsbury's once as I really wanted them to stock something specific. I asked in store every week whether they had it, and eventually they did. And it's still there and I still buy it. But if Sainsbury's ever stops stocking it, I will speak up again, and that's what I think must be done with John Lewis. Keep visiting your haberdashery department, keep an eye on it, spend money in it and let's make sure that John Lewis never ever thinks about closing it, because it quite simply makes too much money and is too loved. And as I said, I will be going back to John Lewis and checking that everything I was told would happen, is happening. Finally though, I wanted to say big thanks to all of you who got in touch, tweeted and supported me in my petition – it worked, John Lewis noticed us and even though the closing of the haberdashery departments turned out not to be true, it did so much to reaffirm the importance of haberdashery in the 21st century.